USA White treated fans to a 100-75 win over USA Red in an intrasquad exhibition game that capped off the South Carolina portion of the USA Basketball Women’s National Team’s training camp on Wednesday night at Colonial Life Arena in Columbia. The USA next will head north to play exhibition contests against Canada at 7 p.m. EDT on Sept. 8 at Webster Bank Arena in Bridgeport, Connecticut, and against Japan 7 p.m. EDT on Sept. 10 at George Washington University in Washington, D.C. Tickets are available at usab.com/WNTtickets, and the games will be televised on NBA TV. USA Red jumped out to a 29-23 lead after the first quarter, but USA White outscored Red 27-11 in the second and 20-10 in the third to pull away. For the victorious USA White, Arike Ogunbowale (Notre Dame) was the game’s high-scorer with 18 points and five assists, and former South Carolina Gamecock A’ja Wilson (Las Vegas Aces) added 16 points and seven rebounds. USA Red was led by 17 points from Nneka Ogwumike (Los Angeles Sparks) and 16 points from Diamond DeShields (Chicago Sky). DeShields helped ignite USA Red in the first quarter, scoring 12 points in the first 10 minutes, and along with two made 3-pointers from current Gamecock Tyasha Harris (South Carolina), USA Red led 29-23. The first period also saw USA red record seven assists on 11 made shots, while both teams started the game shooting well – 61.1 percent for Red (11-18 FGs) in the first and 52.6 percent for White (10-19 FGs). The momentum swung over to USA White’s side in the second quarter, as eight of the nine team members put points on the board in the period. Led by seven points in the period from Wilson and six from Napheesa Collier (Connecticut), USA White took a 50-40 halftime lead. In the third quarter USA White again got points from eight of its nine team members, and its offensive balance proved difficult for USA Red to slow down. 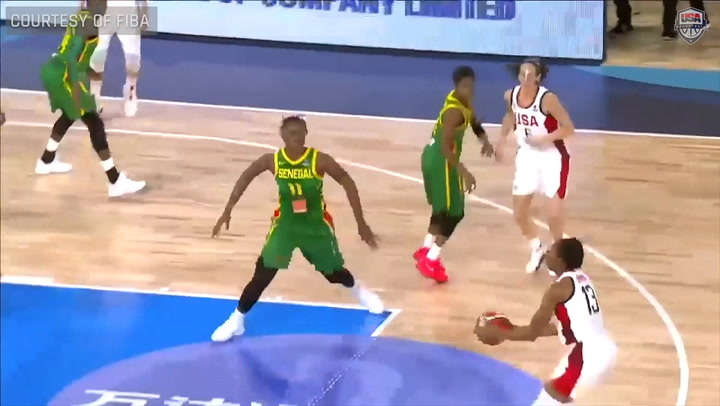 USA White outscored Red 20-10 in the third to lead 70-50 with 10 minutes left to play. USA Red managed to nearly keep pace with USA White in the fourth quarter, but scoring 30 points to Red’s 25 points, USA White earned the 100-75 win. For the game, White recorded 22 assists, including six from Layshia Clarendon (Connecticut Sun), while former University of South Carolina student-athlete Allisha Gray (Dallas Wings) added 13 points, Jessica Shepard (Notre Dame) contributed 12 points, including the 100th point of the game, and Collier rounded out White’s double-digit scorers with 10 points and nine rebounds. 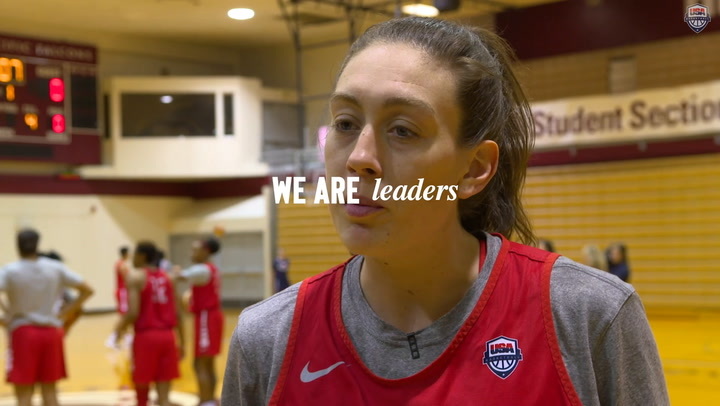 Additionally, Morgan Tuck (Connecticut Sun) added 12 points for USA Red, while Sabrina Ionescu (Oregon) distributed six of Red’s 20 assists for the game. 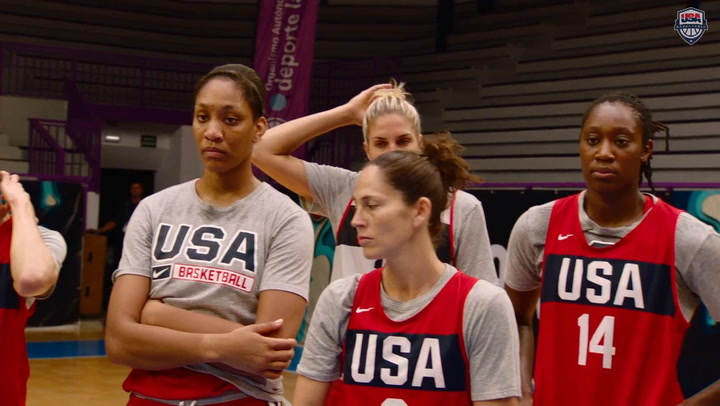 The USA’s official, 12-member roster for the World Cup will be announced prior to Sept. 22.